Rev. Dr. Thomas Raysor, Jr. I have labeled this photograph differently from the Frank Raysor book. I hope I am right in labeling this as Thomas M. Raysor, Jr. If I am wrong, I hope the ancestors will forgive me. "Thomas Raysor, M.D., born April 13, 1827 in the Green Pond section of Colleton County, South Carolina, died November 23, 1896 in Orangeburg, South Carolina. In 1848 he graduated from the Medical College in Philadelphia, but the call to preach was so imperative that he soon left his medical practice to join the Conference in 1850. His natural dignity and eloquence in preaching was dominated by love and tenderness that made him a most beloved leader among his comrades. To his wife and children he was greatly devoted. As a pastor and presiding elder he was truly a servant of God and man." From a book of biographical sketches of the Methodist Ministers of the South Carolina Conference. According to Frank Raysor, Rev. Thomas Raysor was presiding elder in many different districts of South Carolina, but salaries were low, so he had to farm in order to support his large family. 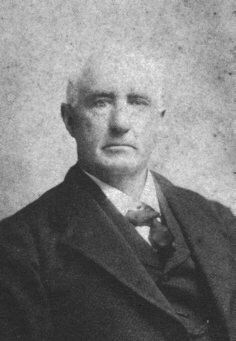 He owned a lot of land in what is now Bamberg County and recorded in the courthouse in Bamberg is a deed showing that my father, Harry Raysor, bought that land from all the other children and then sold it to his niece, Maud Sabin and her husband, and they later sold it to her husband's brother. Note: this is the land north of SC Hwy 321, west of Highway 362 in Bamberg County. See Turkey Cut Road. "Rev. Thomas Raysor, M.D., was born in the Green Pond section of Colleton County, S. C., April 13, 1827; graduated in medicine at Philadelphia, Penn., in 1848. He practiced his profession for one year - when feeling 'called of God to preach' - he gave up his expected life work, and in the year 1850, he was 'admitted on trial' by the South Carolina Annual Conference. In the pastorate and in the Presiding Eldership he was faithful to every trust committed to his hands. To him God gave large success. "The ministerial office he emphasized. His call to preach was as real as that of Saul of Tarsus. He felt that he must preach the gospel, and preach it in the most effective way possible. That to go unprepared into the pulpit was a reflection on God and an imposition on the people. He would be no cobbler in the ministry. For this reason he was a close student as long as he lived. He bought and studied the best books. He delighted to bring out of God's book 'things new and old.' In one of the last conversations that he ever had with me, he outlined a course of study that he had mapped out for himself, a course that would be exceedingly helpful to pulpit work. Possessing a fine mind and with this close and continuous application to study- he became a splendid preacher. The learned and unlearned heard him gladly. His sermons were delivered with great unction. Take him sermon after sermon, and he would compare well with any man in this Conference. Like Apollas he was an eloquent man and mighty in the Scriptures. When he a few days ago reached the shining shore - scores and hundreds of those that he had led into 'the narrow path' must have given him a royal welcome. "Pastoral work he didn't neglect. His sermons were followed by house to house visitation. In the homes of the people he was ever a welcome guest. In receiving the felt that they were giving entertainment to one of God's angels. He was so modest, gentle and pleasant that the smallest child did not hesitate to climb into his lap, and to childhood's innocent prattle he gave an attentive ear. The result was, he wa solved by old and young, the rich and the poor. They felt assured that in him, they had a sincere friend, a friend that would never prove false, a friend whose devotion would stand the test of the hottest fire and come forth as pure as Australian gold. "In the home circle he was seen in the light of true devotion. For wife and children his love was as boundless as the sea and as fervent as that of the angels for Heaven. His was a home of love. It was crowned with a diadem set with rare jewels. Here flashed the sapphire of kind words, the amethyst of thoughtful care, the emerald of devoted attention and the topaz of loving sympathy. Here relationship mingled into earthly bliss. Everything that he could do to make his home an earthly Eden was done - how well he succeeded the broken-hearted wife and sorrow-stricken children, who weep over his departure, fully know. To them it was paradise restored. "His Christianity was one of the purest and most exalted character. He knew in whom he believed. With God he talked as friend with friend. Like Abraham he was the associate of God, like Enoch he walked every day in his company and like John he often rested his weary head upon the Divine bosom. "At the Boiling Springs Camp-meeting last year, a sermon was preached at 11 o'clock on Saturday on 'The Keeping Power of God.' During the delivery of the sermon Dr. Raysor became intensely stirred. At its close he shouted aloud the praises of God. after dinner I went to the preacher's tent. He was there alone. As I entered I saw that his face was shining like a seraph's and that his eyes blazed with a glory that was not of earth, seeing me, he said: 'I am glad you have come, for I want to talk with you about what I have felt and seen today.' Putting his arm around me we walked to the rear of the tent and sat down. For thirty minutes he talked. Would that I could recall that conversation - but it is impossible. Like Paul he had been caught up into the third Heaven. As we separated he said: 'As I stand here on the mountain top of this experience, I feel like walking straight through the door into Heaven.' Before him, the door seemed to have been thrown open wide. "A few days before his fatal illness, he wrote me a long letter. In it he spoke of the great pleasure he anticipated from attending this session of the Conference. God has prepared for him something better. He did not respond to our roll call, for he has answered the roll call of Heaven. Today he is with 'the Saints of all Ages' - in the 'land immortal.' "
"A story told me by older members of our family was that he brought his family to Columbia in covered wagons to avoid Sherman, but instead he got right in his path. At this time (1864-1865) he was the Presiding Elder of Charleston District- I don't know where he actually lived, but several years before and several years after he was pastor at Branchville and Bamberg. He camped in Columbia with his family by the river, (I don't know which river) and one night his sons William and Harry (my father) with some other small boys stole some kegs of powder from some of the Yankee's supply wagons. The next day they lighted the fuses and threw the kegs into the river. There was a terrible explosion and fish were thrown onto the bank. They started to retrieve some of the fish but the Yankees came running to see what the explosion was all about. They though some Confederate soldiers had come back and were firing on them. I don't know what explanation the boys gave, but they got off with a lecture. As a minister, and as a doctor, Thomas Raysor called on General Sherman, personally beseeching him to give him medical supplies and food for the sick, and clothing for the aged and destitute. General Sherman berated the South and especially South Carolina and told Grandfather that it was all the fault of South Carolina and that South Carolinians had set Columbia on fire. However, after a lecture the General did give some of what was requested to grandfather."